Should You Pay More Than Your Credit Card’s Minimum? Most people are unable to buy the home of their dreams because of their poor credit scores. Having a large amount of credit card debt across one or multiple cards can present obstacles. Some people feel they can only afford to pay their credit card’s minimum monthly payments, while others wonder if they should be paying more than that. 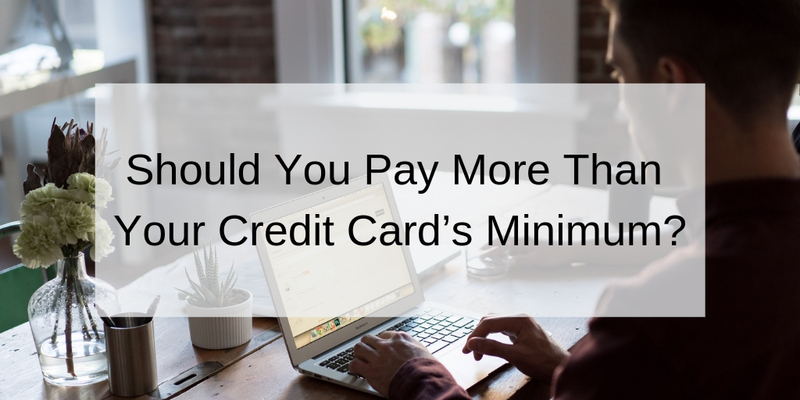 Today we answer the question of whether should you pay more than your credit card’s minimum and how paying more than the minimum offers many benefits. The snowball method works well for people who have a lot of credit card debt. First, you must check how much you owe for each card. Start off by paying as much as you can on the credit card you owe the least. Once you’ve paid it off, pay off the card with the next highest balance. The avalanche method consists of paying off the credit card balance with the highest interest rate. This works best when you have a balance you know you can pay off in five years or less. It also works best for people who have the patience to pay off a debt over a long period of time. Regardless of whether you choose the snowball or avalanche method, you’ll pay less in interest the faster you get rid of your debt. The snowball method allows you to pay off small debt sooner, while the avalanche method allows you to pay off your debt with the highest interest rates first. You can choose the right method to pay off credit card debt depending on which one makes you feel better. The snowball method fits people who need small victories to motivate them, while the avalanche method works best for people who are more patient. Though there are many ways to improve your credit score, paying off credit card debt is one of the best ways to do so. FICO scores are confusing by design. Paying off your debt is one way to ensure you’re on the right path toward improving your credit score. Paying off credit card debt requires you to make lifestyle changes that will help you pay for a mortgage. You can even use apps such as Mint to track how you spend your money in order to have a better idea of where your money is going. Another key benefit of paying off your credit card debt is how much doing so can improve your credit score. Bolstering your credit score will give you more breathing room with your credit cards as you’ll have higher limits. Having low credit card debt is important if you’re hoping to buy a home or car in the future. Your mortgage and automotive interest rates will likely be higher if your credit is poor. You may not even qualify to be a homeowner if you have too much credit card debt. While improving your credit score may sound daunting at first, our team of experts can help to permanently fix your credit in no time. Contact us today!